State-of-the-art equipment includes the new generation High Definition survey system Scan Station or 3-D Laser Scanner. This equipment enables us to provide a level of accuracy, efficiency, crew safety, and available data not achievable with conventional equipment. Using this equipment, we have the ability to acquire locations for nearly every piece of critical information by producing a virtual 3-D point cloud. 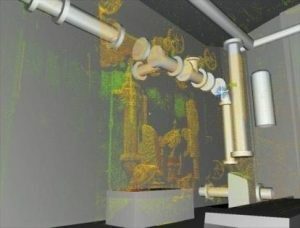 The point cloud imagining capability allows us to visually review the field-collected data sets for completeness as the survey progresses. The end result is a cost-effective survey product that provides greater unobstructed detail in a shorter period of time, while keeping the surveyor out of harms way. Our surveying expertise includes boundary surveys, typically to ALTA/ACSM standards; topographic; photo control; hydrologic; instrumentation; construction stakeout; and route surveys. We have served on private, municipal, state, and federal projects, including open-end surveying services for the U.S. Army Corps of Engineers — Nashville and Huntington Districts. Contact us for more information about our Surveying and Land Acquisition Services.